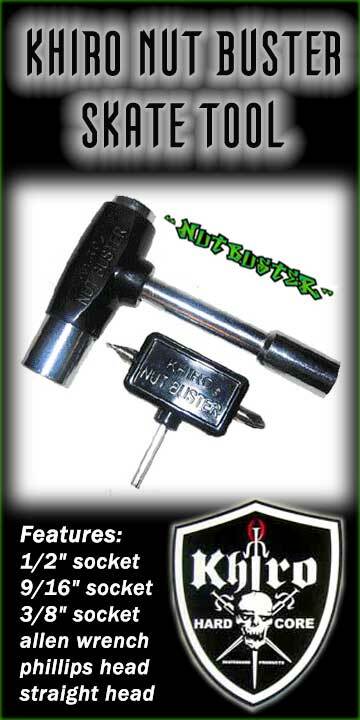 KHIRO NUT BUSTER SKATE TOOL -- The skate tool that does it all! Features a 1/2" axle nut socket, a 9/16" king pin nut socket, 3/8" hardware nut socket, an allen wrench, a phillips head and straight blade screwdriver. Overall dimensions: 4" x 2.75" x 1"
ABOUT KHIRO: Khiro Skateboard Products are engineered and manufactured in Southern California of the highest quality materials. The line includes bushings, risers, hardware, specialty kits and more for use in all areas of skateboarding, such as street, banks, bowls, rails, gaps, transition, big vert, pipes, slalom, downhill, etc.